You are here: Home > Taking responsibility: what does it mean? 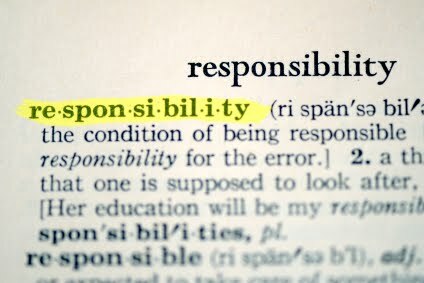 Taking responsibility: what does it mean? Imagine this scenario: A woman, after reviewing the evidence from both sides, after carefully considering the increased risks, and after deciding that she is willing to accept the responsibility for the outcome, decides to … smoke cigarettes. This situation happens all the time. Indeed, a substantial portion of the population smokes cigarettes. In 2011, everyone knows that cigarette smoking increases the risk of lung cancer, emphysema and other diseases. However, most smokers will accurately point out that not everyone who smokes gets a smoking related illness, that smoking provides both pleasure and concrete benefits such as relaxation and increased concentration, and that adults are entitled to make their own healthcare choices. In addition, there are scientists who assert, and who have testified under oath, that the harms from smoking have been dramatically exaggerated. So if a woman claims to have made a knowledgeable decision to smoke cigarettes, and is aware of the potential consequences, does that mean that she is “taking responsibility” for her health? In one very real sense, it does, since she is the one who will suffer if any harmful effects ultimately occur. She is the one who will gasp for breath with emphysema, she is the one who will endure treatment for cancer and who may die a painful death from it. However, it most other ways, she has no intention of “taking responsibility” for her health. First, most women who elect to smoke cigarettes have some measure of denial about what is can happen. They tend to grossly underestimate the risks of getting a serious illness; they tend to be unaware of a variety of less common illnesses caused by smoking (bladder cancer, peripheral vascular disease); and they tend to drmatically underestimate the impact that emphysema, lung cancer and other diseases will have on their life as a whole. So while they may be technically “educated” about the risks, they are not acting with a clear eyed assessment of those risks. Second, smokers have no intention of managing any complications alone. If they get emphysema or cancer, they will expect and demand state of the art treatment for those diseases. They caused their own disease, but they will expect and demand that others do everything possible to cure or at least ameliorate it. Moreover, they have absolutely no intention of paying for their decision. They bought insurance for just this eventuality. As far as they are concerned, other, healthier people can pay for their illness with higher premiums overall. In a very real sense, they don’t plan on taking ANY responsibility for their health. They plan on other people doing all the work, and paying most of the money to rescue them if their choices were wrong. The bottom line is that women who “take responsibility” for smoking are generally in denial, grossly underestimate the risks of serious harm, have no intention of fixing their own medical problems, and have no intention of paying the bulk of the cost from those problems. Homebirth is very similar. Most homebirth advocates have no clue as to the real risks of homebirth. Second, most homebirth advocates are in denial about the fact that serious complications can occur in low risk women. Third, homebirth advocates expect, demand (and sue) for state of the art medical care to rescue their babies and themselves from their own choices. Fourth, homebirth advocates have absolutely no intention to pay the bulk of the costs that may result for their poor choices, ranging from a long term stay in the NICU to life long special needs assistance for an impaired child. In other words, all the talk about homebirth advocates “taking responsibility” for birth is just talk. In the ways that count, homebirth advocates expect everyone else to do all the work, take all the responsibility and shoulder the bulk of the expense for their choices. Homebirth advocates intend to take precisely the same responsibility for their health that smokers intend to take, in other words, no responsibility at all. A version of this piece appeared on Homebirth Debate in March 2008.